In the morning of October 6, 2017, a Friday, a newspaper publication in Davao has published an article about Tawi-Tawi. I was delighted at first to see that our efforts in May 2017 to finally open Tawi-Tawi to those who see it as war-torn as something to be proud of as Filipinos. Unfortunately, what made this day different from any other day is that we saw very similar data down to its word that was extracted from our documentation. It caught our attention and so we took a deeper look to see what might have transpired. Was it plagiarism? Schadow1 Expeditions is a personal mapping advocacy and travel resource. Its expeditions are primarily fueled by the writer's personal earnings from its day/night regular job. Sometimes, generous readers pledge their donation as they support our cause in ensuring that a Filipino would not be a stranger to his own motherland. We usually go to places "less-traveled" and "less-mapped" in the country to provide information for Filipinos regarding those destinations. To protect our mission, interests and of our stakeholders' support to our cause, we control and maintain the quality data we provide for the Filipinos. Thus, even though we freely share our data to make this a reality, we put up licenses to protect the soul of our mission. Most of our data are licensed as CC-BY-NC-SA (see our license page). A type of Commons license that freely allows distribution of information obtained from our expeditions, so that it can easily be shared among Filipinos and can be modified as long as it will be attributed to its source for non-commercial purposes. Having this license allows Filipinos to learn more about our country and also a possibility for us to earn something to fuel our expeditions and provide more interesting and new data for the Filipinos in terms of geographic, geospatial, culture and navigation. Over the years, humanitarian and relief organizations have also sought the use of our products and data for saving more lives during disasters. For the past years, a lot of smaller websites, blogs, and some corporations have been tempted (aware or unaware) to use our data for commercial purposes, edited our photos, removed our watermarks, copied our content and marked them as their own. Most of those caught were properly informed. Some have apologized and took down the material. Some did not respond and were reported to authorities. Most of these websites are now taken down or have paid a price for their disrespect for intellectual property. However, what transpired on October 6, 2017, was different. 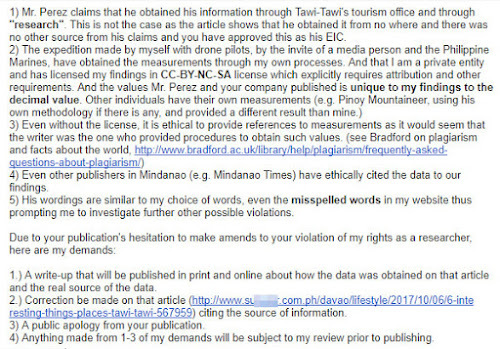 It was because a long-standing news publication agency, specifically in Davao, has decided to publish an article with very similar wordings and values accurate to the decimal value from our mapping expedition in Tawi-Tawi on May 2017. Even our wrong spelling of a mountain in Languyan, Tawi-Tawi was copied. Astounding as it is, there was no citation pointing to us as the source of the data but was instead credited to its writer/editor. 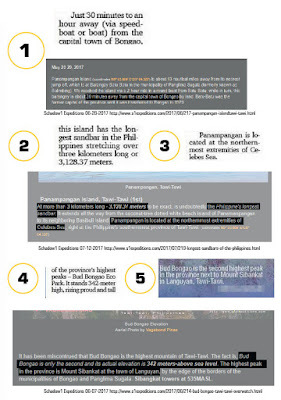 When we have reported this incident to their Editor-in-chief, Stella Estremera, we received a disappointing reply - a reply which states her reporters and editors are "schooled about plagiarism", and that they have acquired the information through the tourism collateral given to them by the tourism office. The reply of the publication's Editor-in-chief to our notice of plagiarism. "It's funny how you think that you owned "fully" those public information." Schadow1 Expeditions provides accurate mapping data through our methodologies and tools we acquired and developed through hard work. This is then made available to the public so that it can be shared for non-commercial purposes while being properly attributed. This explicitly does not give anyone the right to take credit on our findings and results of our expeditions. 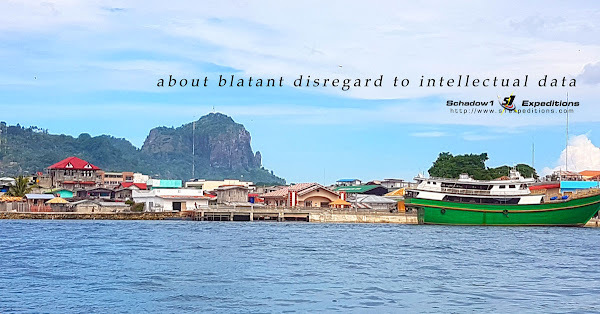 Even our expedition members in Tawi-Tawi are making strides to respect this right by asking permission and attributing data from our own expedition when it is being posted elsewhere. And even if this news publication later claims that the information was taken from another who could have possibly committed plagiarism, they have the sworn duty as journalists to extend an extra arm to research and ensure the data is accurate or to check if some other entity might have made a study to provide such values as a form of respect to the researcher. Contrary to their claim that the writer never heard of us, the source of the data they have published can easily be obtained through Google search; even Wikipedia cites the data to us. After all, the data we provided is only four months old as of this writing and has not yet been adopted as a common fact when other people have also provided data with different results. A write-up that will be published in print and online about how the data was obtained on that article and the real source of the data. Correction is made to that article citing the source of information. A public apology from its publication. Anything made from 1-3 of the demands will be subject to our review prior to publishing. Until this point, the newspaper in Davao remains hard on their stance not to apologize nor to properly cite the data to us. While Department of Tourism is still being contacted regarding the veracity of the claim of the editor and editor-in-chief. Writers and scientific researchers in the country must be aware that such blatant disregard of their rights is present even by long-standing newspaper publications. On October 15. 2017, Schadow1 Expeditions filed a complaint to Civil Service Commission (8888) against Secretary Ayesha Mangudadatu-Dilangalen of Department of Tourism - ARMM for her non-response after a week of inquiries regarding the plagiarism issue that plagues the Davao publication. The editor of Sunstar Davao claims he merely copied from the secretary and through the brochure the department provided. 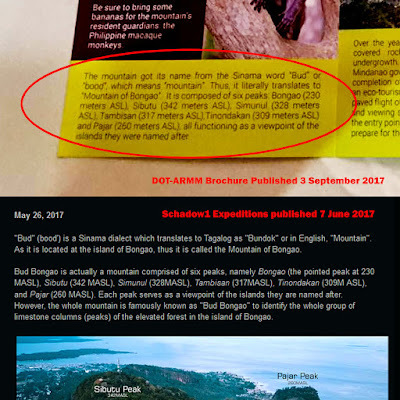 In spite of the awareness of both the publication - Sunstar Davao, and DOT-ARMM regarding the source of information they copied and the demand of Schadow1 Expeditions to point the data to us, they were only busy cleaning up the dirt and pointing fingers instead of doing the right thing. Mr. Garcia and Emboscado's statement are still being sought. Those are the examples of public officials which must not be emulated, how stupid to commission someone for information which are public knowledge and whose royalty I assume is not more than Php 71,000 of the public money spend on plagiarism. I hope that those responsible be held accountable. Schadow1 Expeditions is a travel and mapping advocacy resource for the Philippines. We travel, climb and dive the whole country to enjoy it and map it. Bringing you experiences, memories, and photos of the places we have been to and then map it to ensure that a Filipino would not be a stranger to his own motherland. Who we are and what we do? Help me on my server maintenance and operation costs; and travel expenses to continue providing the most accurate and up-to-date GPS-assisted navigation map of the Philippines as well as travel guides. Going in and Out of Cavite - a comprehensive guide to the province where the Philippines as a country started. Schadow1 Expeditions by Ervin Malicdem is licensed under a Creative Commons Attribution-NonCommercial-ShareAlike 4.0 International License. Permissions beyond the scope of this license may be available at http://www.s1expeditions.com/p/license.html. Copyright 2019 Schadow1 Expeditions. All rights reserved. CC-BY-NC-SA. Powered by Blogger.